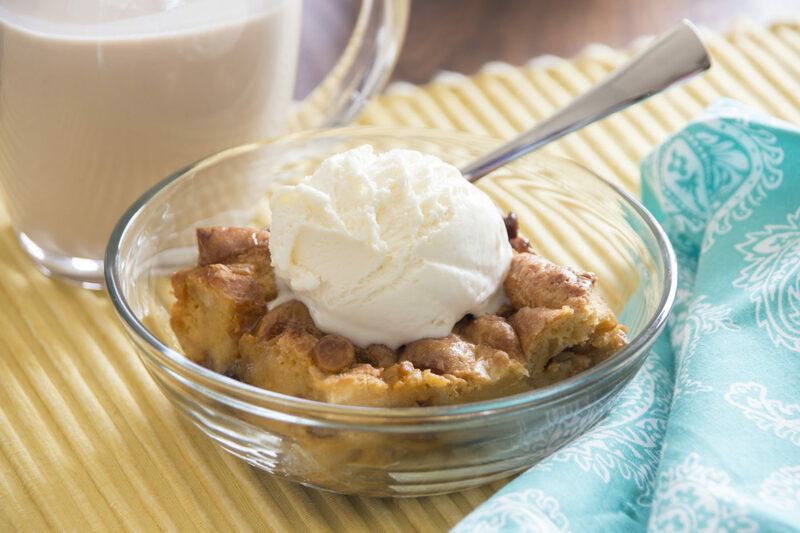 The ultimate comfort food, Butterscotch Pecan Bread Pudding. Home baked goodness. Spread bread or roll cubes, 2/3 cup butterscotch morsels and pecans in the bottom of a sprayed 9×13-inch baking pan. In a heavy saucepan, cook 1 cup milk over medium heat, stirring often, 3 to 5 minutes (do not boil). Remove from heat and add remaining butterscotch morsels, stirring until melted. Add sugar, stirring until dissolved. In a medium bowl, combine remaining 1 cup milk, eggs and vanilla. Gradually stir about 1/4 of hot butterscotch mixture into egg mixture. Add egg mixture to remaining hot butterscotch mixture stirring constantly. Pour over bread cubes in baking pan. Press bread cubes down to absorb mixture. Bake at 350°F 30-35 minutes. Serve warm with vanilla ice cream, if desired.